Blackie Norton (Clark Gable) owns a saloon, the Paradise Club, in the Barbary Coast district of San Francisco. Despite many attempts by his old friend Tim Mullen (Spencer Tracy), a Roman Catholic priest, to push him toward reform, Blackie keeps up his lifestyle of gambling, atheism and debauchery. Mary Blake (Jeanette MacDonald) is new to town, a transplant from Benson, Colorado who is a talented and classically trained singer. She’s down on her luck, with no job and having just lost her apartment to a fire. Mary is desperate for work, and Blackie decides to hire her. She soon becomes a star and the main attraction at the Paradise Club, but The Professor (Al Shean), the club’s piano player, predicts that with a voice like hers she won’t be staying “on the Coast” for long. As their personal and professional lives become increasingly complicated, time marches toward April 18, 1906, the fateful date from the film’s introductory text (quoted above). San Francisco was directed by W. S. Van Dyke, reportedly with some assistance by D. W. Griffith. This film marked the first of three films starring the Gable/Tracy screen team; It was followed by Test Pilot (1938) and Boom Town (1940). My first thought upon beginning San Francisco was, “Is Clark Gable reprising his role from Manhattan Melodrama, but in a different town?” His name is Blackie, he’s got the good-influence best friend (this time a man of the cloth played by Spencer Tracy rather than a lawyer played by William Powell). 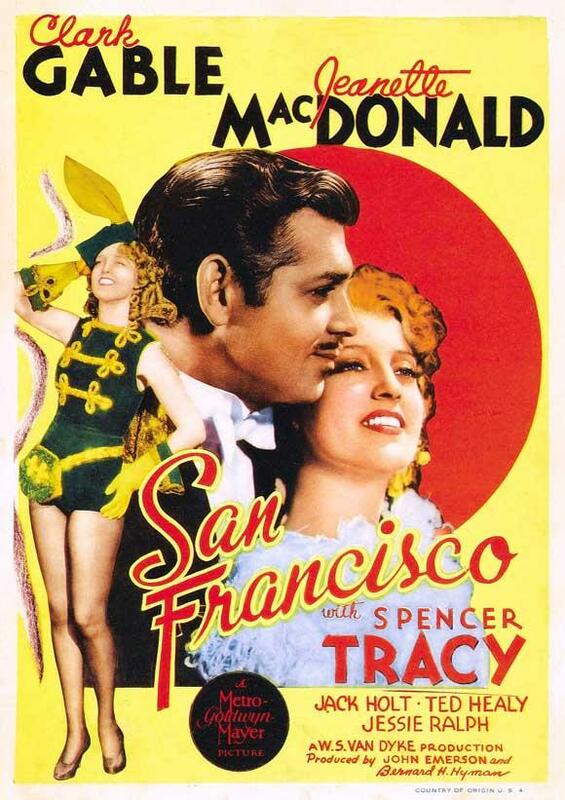 The Blackie of San Francisco is a bit more interesting than the Blackie of Manhattan Melodrama since he ends up running for political office and has aspirations and motives separate from the dirty ol’ world of gambling, but the characters are still quite similar! Unfortunately this film doesn’t quite measure up to Manhattan Melodrama, which I consider a favorite from Gable’s filmography. The songs are nicely delivered by MacDonald who was, of course, an incredibly talented vocalist. The performances are solid. The story has a decent level of drama to keep the viewer interested, but the plot isn’t quite as riveting or complex as I expected it to be. The film doesn’t really reach its full potential for emotional impact and drama until the final 30 minutes, which begin with the shocking (and very nicely-staged, considering the special effects technology available at the time) earthquake montage scene. I saw this one at a theater back in ’93 (for 25 cents! ), and thought it was a fairly entertaining movie…but I have a question you can help me with. I remember there being TWO separate earthquake scenes in the movie, which at the time I thought was pretty cool, because the second one took me by surprise. But it sounds like there was only one! Is my memory that bad? Was there really only one earthquake sequence? Or was there maybe a break between tremors? Just one major earthquake sequence, but it is a very long one (about 20 minutes of the final 30, if memory serves). Perhaps you’re remembering it that way because of the length? There are also some explosions after the ‘quake as firemen try to get the blaze under control, so you could be remembering those. Thanks, Lindsey! It’s weird how I remember it…one quake which did major damage, then a stretch of time where everyone recovers, and then another quake hits! It’s what I remember loving about the movie…and it never even happened! Now I wonder what other movie memories I’ve messed up; Rick and Ilsa do get together at the end of Casablanca, right? Nope! One earthquake, and then Gable runs around the city frantically looking for MacDonald. He finds her in a park where she’s leading earthquake survivors in song as they all celebrate the fires finally being put out (which sounds a lot cheesier in writing than it comes across in the film). As for Casablanca, you’re wrong again. Ilsa ditches both Rick and Laszlo in favor of Capt. Renault — the obvious choice. Thaaaaat’s right…and Rick and Laszlo get on the plane bound for Lisbon, but find out it’s being hijacked by…Carl the waiter! I’m glad you cleared that up for me!